2 days ago, american & british media reported that President Obama made a surprise visit to Stonehenge after NATO summit. Last year i blogged that Vice President Joe Biden made a surprise visit to a hawker centre in SG. Tourists like local unique stuff & not going to shopping malls with spam shops(chain stores). In the middle of last month, the hybrid regime announced plans to develop Jurong Lake area to be a tourist area. In the west, Jurong Lake park has become a foreign worker 'picnic' enclave on weekends as these foreign workers congregate there. Where else can they go with the high cost of living & transportation? If i'm in their 'wage shoes', i'll do the same too. I'll be cycling on the main road if i have to cycle further west on weekends. I try to avoid cycling on the park connector in the Jurong Lake area due to it being crowded with foreign workers & the experience of being a foreigner in my own country. Already the prime shopping district of Orchard Road has become a 'Manila' on sundays. Imagine the damage done to tourism on a sunday as tourists experience 'Manila' in SG without going to the Philippines. How would tourists feel when they are not serviced by locals for the local experience but instead are attended to by cheaper foreign workers who might share the same country of origin? eg. PRC tourists serviced by PRC foreign worker import? How would you feel if you are in a similar situation as the tourist? There's nothing great about the myriad of shopping malls in the prime shopping belt. People can buy most stuff online with a few clicks. Open fields are becoming scarce on this tiny island. As you can see from the picture above, the hotel is more than half done. Thus the hybrid regime's plan to add plenty of toilet bowls to grow GDP at all costs is already well on their minds before announcing to the peasants last month. 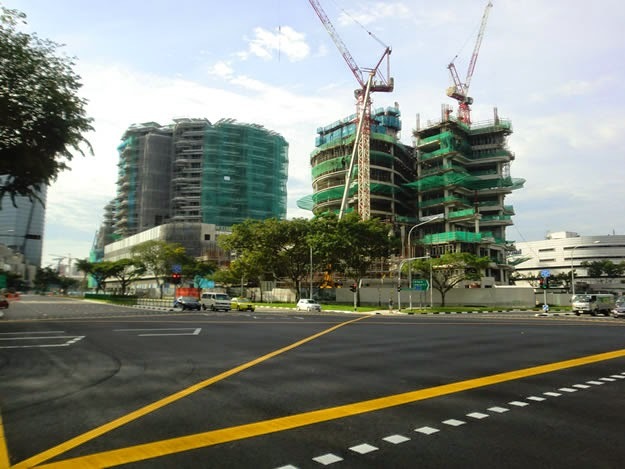 There's plenty of construction going on in Jurong East resembling.the Creepy Construction Mania - Choa Chu Kang(blogpost) & elsewhere. Big Box construction nearing completion. Another shopping mall. Note the bridge link to Jurong East Mall (JEM). Hospital in Jurong under construction. Everytime i cycle past at nights or weekends i feel stress with the construction. So hectic. 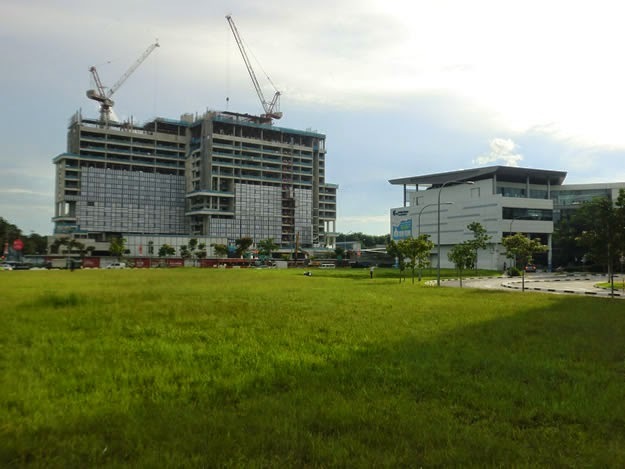 There used to be wide open fields surrounding Jurong East train station. Much of it is gone due to the buy more toilet paper to generate gdp at all costs doctrine. 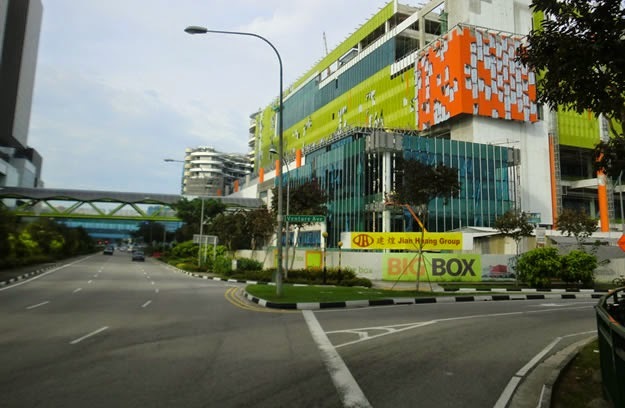 When Big Box is completed, there will be 4 shopping malls in Jurong East within walking distance. Already i've blogged that JCube shopping mall has already suffered a core meltdown. The newest Westgate mall still have vacant shops. The hybrid regime's plan to turn Jurong Lake area into a tourist shopping belt is a mistake. Is also where they plan to have the high speed rail station to Kuala Lumpur, Malaysia. I seriously doubt tourists would want to visit the fake Jurong Lake gardens. I find the spamming of shopping malls with cookie cutter spam shops on this tiny island more & more repulsive. Obama & Joe Biden certainly won't say visiting a shopping mall is an item off their bucket list! Obama visiting big blocks of stones is considered an item on his bucket list. How many stuff/possessions aka consumerism is on people's bucket list? Is visiting a shopping mall with those spam shops in a foreign country an item on your bucket list?